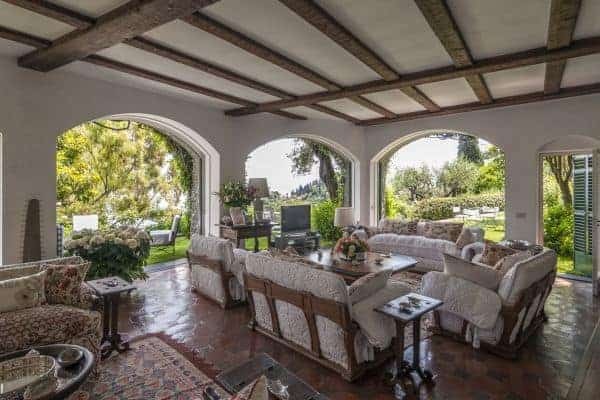 A stunning private estate with a luxury villa commands a panoramic position with alluring and abidingly beautiful views over the most famous enclave on the Italian coast: the legendary Portofino in Liguria, in the northwest of Italy. The small and almost completely pedestrianised centre of this exclusive resort is about 2 hours from Milan and the villa is one of the most prestigious estates in the area. 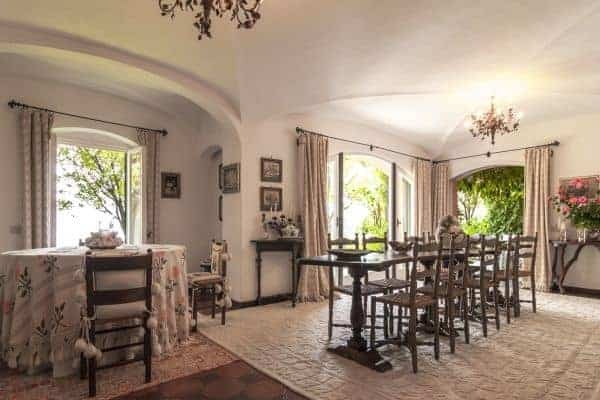 Its prominent position atop a cliff-like hill means that the villa surveys much of the coastline as far as the opposing towns of Chiavari and Lavagna on the other side of the Ligurian gulf. The town is comfortable walking distance from the villa, and reachable through a private elevator carved into the rocks. This beautiful villa features not only a prominently spatial design, but also a regal-like décor, thanks to a classic style with comfort, inside and out and around the luxuriant terraced grounds, created specifically for this property by an eminent landscape architect. 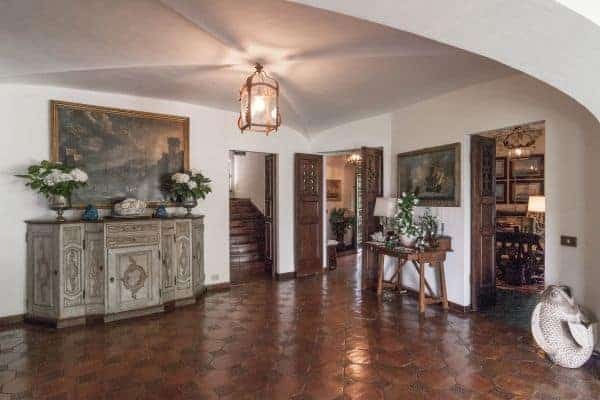 The décor is set against pristine white walls (inside and out), glistening cotto floor tiles and vintage wood shutters and sets an exquisite ambience of select antiques, chandeliers, decorative wrought-iron and quality textiles and upholstering. 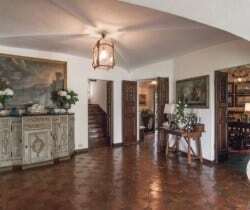 These all vie for your attention and admiration, bathed in natural light, especially in the main living area on the ground-floor, with its seeming continuum of space to the outside with the aid of inconspicuously glazed arches. The charms of the interior spill out to the hillside garden that offers an admirable scope of terracing and dotted with numerous sitting areas for relaxation. Some are in the shade of a pergola or under one of many of the tall, mature trees and most provide lovely options for undisturbed privacy and solitude. As for socialising, there’s an admirable choice of 5 separate dining terraces: bewitchingly shady and foliage-covered idylls that are cleverly positioned to take full advantage of the superb hilltop location: the villa faces the East for sunrise and the southwest facing pool enjoys a beautiful sunset vista. 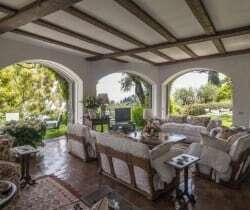 There is private helipad and private access (shared with only 1 other villa) to a rock beach inlet, where it is possible to sunbathe and swim and in the Ligurian sea. The villa is on 3 levels (two above ground) and the arrangement includes 6 spatially ample, colour-themed bedrooms en suite: all on the upper level, each with an impressive view and 2 that open to a large private terrace. 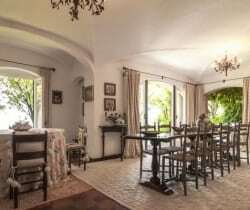 During the day the adults can find their own private spot to nestle down in quiet with a book, bathe in the infinity swimming pool overlooking the sea or lounge on the deck beneath a pergola. The beautiful garden with its paved walkways, manicured lawns and mature Mediterranean trees is a copious playground for the kids, who can enjoy themselves freely as the older generation light up the barbecue and enjoy the ravishing views. Older kids will enjoy having Wi-Fi and satellite TV and adults will adore the unlimited appeal of several charming terraces that are fabulous spots for socialising and entertaining friends al fresco. The luxury hilltop villa guarantees a notably sizzling holiday experience with knockout views, impressive tranquility and unrestricted privacy. The distinct, quite regal ambience makes this a home more enticing to discerning holidaymakers seeking beauty, quality and location above all. However, due to the villa’s position, several areas spots within the grounds warrant a watchful eye to be kept on smaller children. The elegant retreat has a chef, a butler, 2 housekeepers and gardeners that provide exemplary service and upkeep.